Six metal antique, idols including that of a Nataraja idol belonging to the Chola Period (Tenth Century), were excavated on June 2, 1951 at Sivapuram Village in Thanjavur District. At public request, these were handed over to the Siva temple at Sivapuram by the District Collector. When the idols were sent to a sculptor, Ramasamy Sthapathy, for cleaning, two idol smugglers Doss and Thilagar, persuaded him to replace the originals with duplicates. After replacement, the originals were taken to Mumbai, and from there smuggled out of the country. Nobody knew about the replacement of the original idols in the temple till the publication of the book Early Chola Bronzes written by Dr. Douglas Berret of the British Museum in 1965. In the book, the author mentioned that the Nataraja idol at the time in the Sivapuram temple was a fake one. This obviously led to shock and public anger in Tamil Nadu and a case was registered in the Nachiyarkoil Police Station of Thanjavur District on January 1, 1969. Later, the Crime Branch CID took up further investigation and traced this priceless antique idol of Nataraja. How this idol, a priceless heirloom from the cultural heritage of Tamil Nadu, was brought from foreign shores to India makes a fascinating story and is also a tribute to the meticulous investigation and sustained follow-up efforts of the CB CID, Tamil Nadu. This entire sequence has been very vividly captured in an interesting narration by Tr. J. Ramakrishnan, now a retired SP, who worked in the CB CID for nearly 16 years and was associated with the investigation of several important cases including this one. Thanjavur district in Tamil Nadu is the heartland of the Cholas and noted for bronze idol making. Sivapuram is a tiny village that lies in the jurisdiction of Nachiarkoil PS limits in Thanjavur district, near Kumbakonam. On June 2, 1951, while digging the field of Kasturi Ranga Iyengar at Sivapuram village, Annamuthu Padayachi excavated six idols viz: Nataraja, Sivakami Amman, Somaskandar, Gowri Amman, Thirugnananasambandar and Vigneswarar of the Early Chola period (900-1100 CE). The findings were reported promptly to the Tahsildar, Kumbakonam. Muthusamy Mattayar, the Temple Trustee of the Siva Temple at Sivapuram, moved the Collector, Thanjavur to get the idols for worship. The then Director of the Government Museum also persuaded the Collector, Thanjavur and the Government to hand over the idols to it. P.R. Srinivasan, the then Curator, Government Museum, Madras visited Kumbakonam; took photographs of Nataraja and other idols. After carefully considering the claim by the Sivapuram Temple Trustee and the Government Museum, the Government directed the Collector to hand over the idols to the Temple Trustee for worship. The six idols were handed over by the revenue authorities to Muthusamy Mattayar. As the idols were buried under the earth for quite a long time, there was deposit of earth and other materials on the surface of these idols. The Trustee decided to consecrate the idols after cleaning and repairing them. ‘Devi Sirpa Salai’ at Kumbakonam was engaged in making bronze idols. It was owned by Ramaswamy Sthapathy. The Trustee entrusted the six idols to Ramaswamy Sthapathy for cleaning and repairing. Thilagar, a resident of Kuttalam near Kumbakonam, was known to Ramaswamy Sthapathy. Doss, the brother of Thilagar, was a curio dealer at Bombay. Thilagar and Doss saw the Nataraja and other idols with Ramaswamy Sthapathy. They suggested to Ramaswamy Sthapathy to make modern copies (replicas) of five idols – (viz., Nataraja, Sivagami Amman, Somaskandar, Gowri Amman, and Thirugnanasambandar) – and hand over them and the original Vigneswara idol to the temple at Sivapuram for worship. Ramaswamy Sthapathy agreed to this conspiracy. Ramaswamy Sthapathy, with the active assistance of his two sons Jaganathan and Arunajadeswaran alias Sadayappan, and employees Sambandan and Narasimhan made fake idols, and handed them along with the Vigneswara original to the temple Trustee and got the cleaning and repairing charges. Original idols were given to Thilagar and Doss for a few thousand rupees. After consecration, the fake idols were placed in the temple and regular poojas were performed. The innocent Muthusamy Mattayar, never realised that he had been duped by Ramaswamy Sthapathy. The Nataraja and four other original idols were taken to Bombay by Thilagar and Doss and were sold to Major Lance Dane of Bombay for Rs. 25,000. Dane was a Major in the Army during World War II and later became an art collector and prepared art layouts in an advertising firm. P.R. Srinivasan, the then Curator, Government Museum, Madras published the photograph of the original Nataraj idol and wrote an article on the Rare Sculptures of the Early Chola Period in the Lalit Kala Akademi Journal of April 1959. He wrote that “Bronze Natesa and Sivagami”, and a few other bronzes were unearthed recently as treasure troves and handed over to the temple authorities for worship in the temple itself. 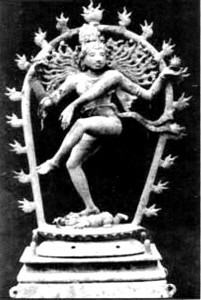 Again Dr. Sivaramamurthy published the photo of Nataraja idol in the journal of the Lalit Kala Academi in 1963, under the caption ‘South Indian Bronzes’. Dane moved from Bombay to Madras in connection with his trade and stayed at Greenways Road, Madras. Queen Elizabeth paid a visit to India in 1961. She also visited Madras City. The Government of Tamil Nadu released a brochure during the visit. The art layout of brochure was entrusted to Dane who published the photograph of the famous Nataraja idol. This never drew the attention of anybody in Tamil Nadu including that of persons/officials connected with art treasures. The Nataraja idol was with Dane from 1954 to 1967. Then he sold the Nataraja idol and Somaskandar idol to Bomman Behran of Bombay, an art-collector, in 1967 for 25,000. The other three idols were disposed to Dr. Immanuel Schlessinger, who could not be traced. Douglas Barrett wrote in his book Early Chola Bronzes that the Natarajar idol formerly in the Siva Temple at Sivapuram had been replaced with a modern copy and the original was with a private art collector in Bombay. P.R. Srinivasan wrote a letter to the Director, Government Museum, to verify the idols installed in Sivapuram temple for worship. Accordingly, Gnana Desikan, the Curator, Government Museum, at the time and others visited Sivapuram temple and found the Nataraja to be a fake. The snake hood was also wrongly placed in the fake. The Director, Government Museum, Madras, in turn informed the Government. In 1968, Manu Narang of Bombay purchased the original Nataraj idol together with other idols from Bomman Behran for a few lakhs. In the same year, Ben Heller of New York, U.S.A. visited India and attended the marriage of Raman Narang, brother of Manu Narang. He saw the Nataraja idol. The Nataraja idol alone was purchased for a few lakhs and smuggled out of India from New Delhi by Japanese Airlines through unconventional channels in 1969. The Government of Tamil Nadu swung into action immediately after receipt of a letter from the Director, Government Museum, and preferred a complaint with the Deputy Inspector-General of Police, C.I.D. in 1969. The State C.I.D. registered a case in Nachiarkoil P.S. Investigation was taken up by U.C. Chandramouleeswaran, the then Deputy Superintendent of Police, Idol Wing, assisted by a team of officers. This team was also to collect lot of useful information. Ramaswamy Sthapathy, Thilagar, Doss and Lance Dane were also arrested. The Government of Tamil Nadu permitted S. Krishnaraj, the then Deputy Inspector General of Police, C.I.D. to go to New York, U.S.A. to interrogate Ben Heller and trace the Nataraja Idol. He was accompanied by an officer of the C.B.I., New Delhi. The Interpol Wing / the Customs in New York assisted the Indian police officers in the enquiry. Ben Heller refused to show the idol and to divulge vital information. The Indian police officers returned without success. The investigation reached an impasse. The hope of getting the idol back was shattered completely. However, ‘Luck’ and ‘Destiny’ played a vital role later. Ben Heller, sensing further trouble from the Indian Police, sold the Nataraja Idol to the Norton Simon Foundation, California for one million dollars in 1973-74. The Foundation purchased the idol without knowing its history and background. After purchase, it found the idol affected with bronze disease (corrosion). Hence the Foundation sent the idol to London (British Museum Authorities) for expert treatment to cure the disease. The London authorities recognised the Nataraja idol and passed information to the Arts and Antiques Squad of the New Scotland Yard. Scotland Yard swung into action and impounded the idol. The idol was kept in the Lloyds Bank safe. The Norton Simon Foundation threatened Scotland Yard with a multi-million dollar suit. Scotland Yard informed the Indian Mission at London which, in turn, informed the C.B.I. in New Delhi. The Deputy Director, Co-ordination, C.B.I. with the help of the Director-General, Archaeological Survey of India, New Delhi, visited London and defended the suit. P.R. Srinivasan visited London and identified the idol and filed an affidavit. The Norton Simon Foundation found that they were tightly cornered. They filed several suits against Ben Heller and Manu Narang in the courts of London, New York and California. The Foundation during pendency of suit suggested that they would keep the Nataraja idol for 10 years from 1976 and the same would be handed over to the Indian Representative at Los Angels in 1986. Considering the enormous cost involved in defending the suit, the Government of India also agreed to the suggestion and an agreement was entered into. Ramakrishnan, as Deputy Superintendent of Police, Idol Wing, pursued the investigation, arrested the remaining accused and also the approver Narasimhan. Dr. Nagaraja Rao, Director-General, Archaeological Survey of India, New Delhi visited U.S.A. brought the idol back to Madras and handed it over to the Hindu Religious and Charitable Endowment Department on May 15, 1986. After 30 years, the idol reached its abode. Ramaswamy Sthapathy, Doss and other accused died earlier to the charge-sheet. Narasimha Sthapathy was taken as an approver. On April 20, 1987 A-1 Thilagar, A2 Sambandan, A3 Jaganathan and A4 Arunajadeswaran were charged before Additional Chief Judicial Magistrate, Kumbakonam and they were convicted on May 2, 1988. Source: – The CID Review, 1988.